Protestors at a rally in Downtown Los Angeles. Due to recent anti-immigrant sentiment, various protests and rallys have sprung around the controversial topic. 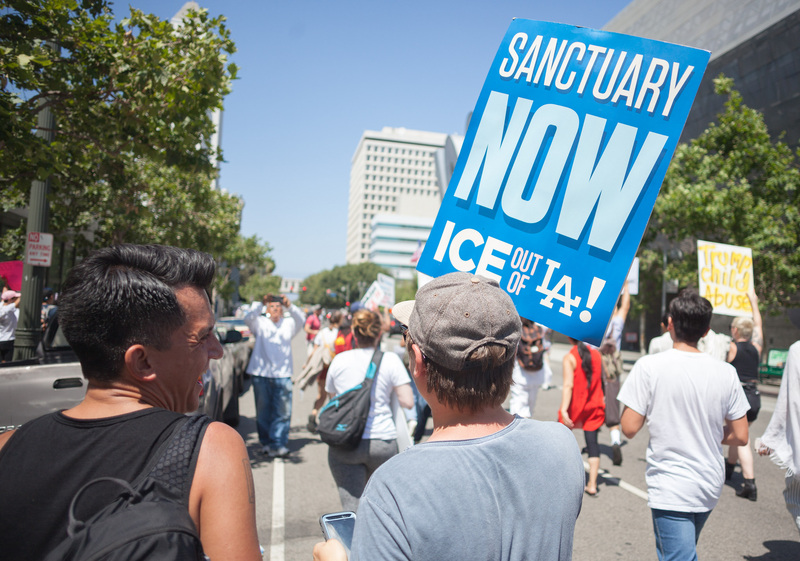 Since President Donald Trump took control of of- fice, Immigration and Cus- toms Enforcement (ICE) agents throughout the country have increased the deportation of un- documented immigrants through policy changes as well as executive orders that have granted ICE agents the authority to arrest and detain undocu- mented immigrants in an increased capacity starting January 2017. Due to these new changes in the policy of our government, many un- documented members of our communities as well as students protected under the Dream Act have voiced their concern about the safety of their future. them; they are law enforcement so we cannot stop them.” these students has at some point been raised. Although our cam- pus and administration has firmly committed to protecting it’s student’s the question remains, how likely is it that ICE will come onto campus? Campus police and the campus administration may not be able to law- fully stop any ICE agents coming onto campus if they have an arrest war- rant for certain individuals. With our campus standing behinds it’s students we must now turn to immigration attorneys in order to further under- stand if ICE coming onto our campus can even happen at all. At a recent school event, President Otto Lee told students that they were guaranteed safety while attending Harbor College and that safety will never leave this campus. Lee also mentioned he understands that there are new federal changes, but pledges to not participate or give out any information to any customs and border official. Student’s opinions on the matter also see to fall in line with the overall campus’ stance on the matter. Next Next post: What does thanksgiving mean to students at Harbor?